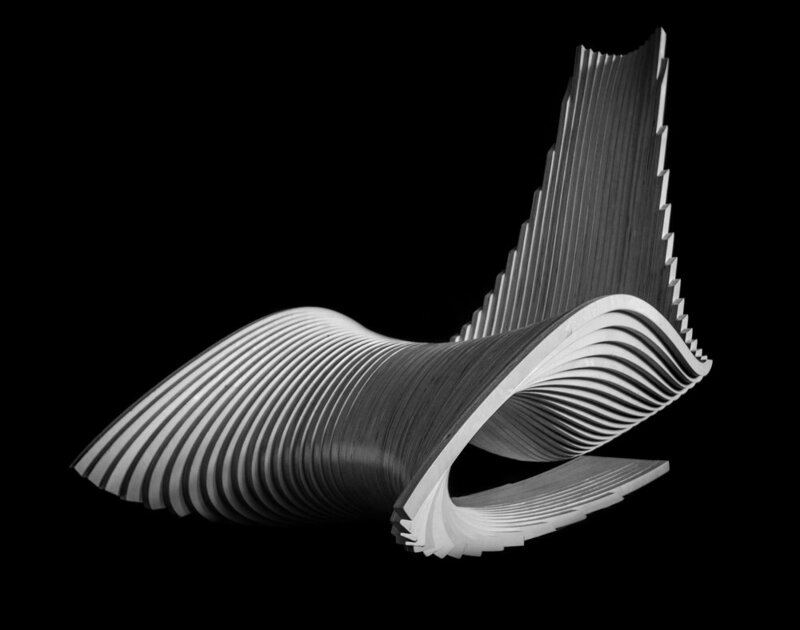 The Diwani Chair is a sculptural Rocker. 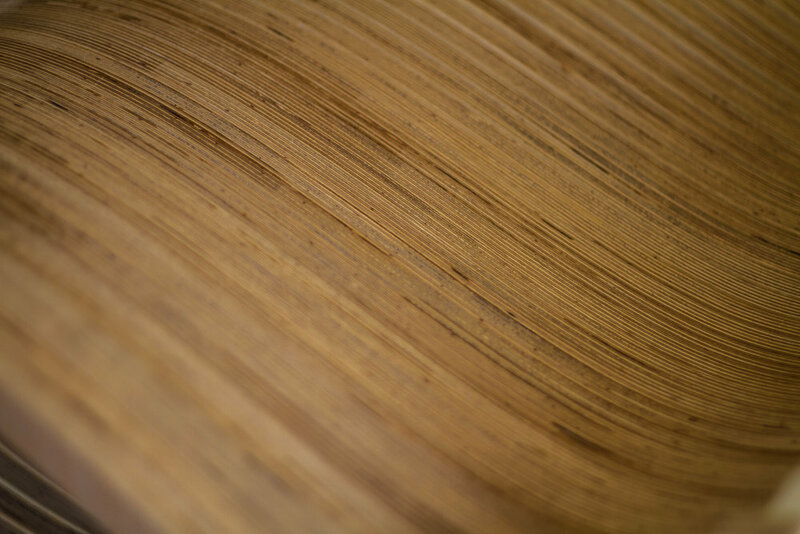 The chair is constructed of precisely CNC-routed sections of high-strength, cross-laminated plywood, which are carefully assembled and hand finished. Comfortably contouring to the seated form, the silhouette of the chair is carefully composed to be evocative and intriguing from all angles. The flowing, sensuous profile is highlighted by the dramatic sweep of the cantilevered seat, while the contoured shape invites you to lean back and lounge. 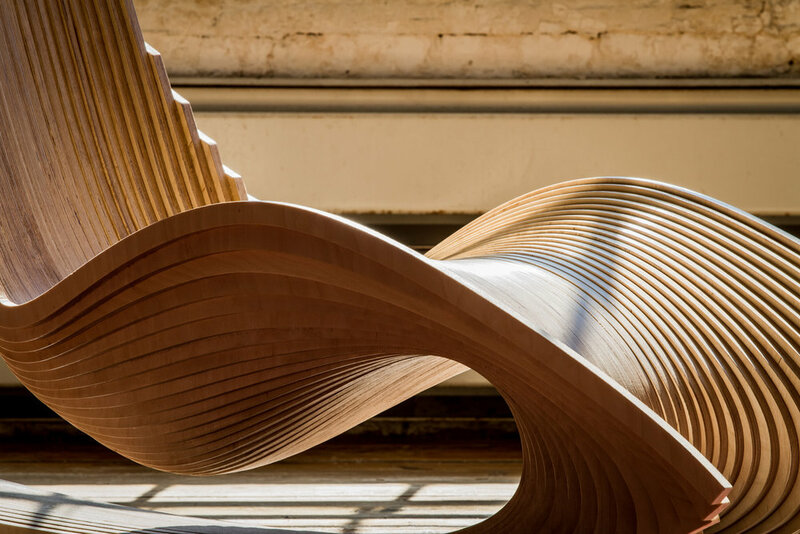 Inherently strong and dimensionally stable, the design of the chair displays the striking visual richness of natural birch plywood by exposing the linear end grain of the wood. Coupled with the complex curvature of each individual “rib,” the resultant surface is exposed as a unique, richly textured, and subtly varied field of linear striations. In order to maintain a low, stable center of gravity and to structurally support the seat’s dramatic cantilever, the thickness of the chair’s individual “ribs” vary considerably in sectional profile. This provides the required strength, stability, and balance while adding visual interest to the overall form. Founded in 2014 in Red Hook, Brooklyn, by Ahmed ElHusseiny, AE Superlab is a collaborative design office, operating at the intersection of art, architecture, engineering, and technology. Prior to founding AE Superlab, ElHusseiny was senior designer and senior associate principal at Kohn Pedersen Fox Associates, where he was responsible for the design and development of a broad range of mixed-use, commercial, retail, and residential projects throughout Europe, Asia, and the Middle East. ElHusseiny received his master’s degree in architecture from the Massachusetts Institute of Technology, where his studies focused on the interplay of architecture, technology, and narrative storytelling. ElHusseiny has received numerous awards and recognitions, including being named by Wallpaper* magazine one of the “World’s Best Young Architects.” Most recently, AE Superlab was awarded the Pinup 2014 Emerging Talent Jury Award. ElHusseiny teaches, lectures, and is a frequent visiting critic at a number of universities including MIT, Harvard, Pratt Institute, Parsons School of Design, and the New Jersey Institute of Technology. In addition to architecture, ElHusseiny’s illustrations, photographs, and short films have been featured at festivals and galleries in New York and internationally.